Poly Double Mailbox Post - - holds two lightweight curbside mailboxes weighing less than 7 pounds. Installs easily over a 4x4 post (not included). Made in USA. 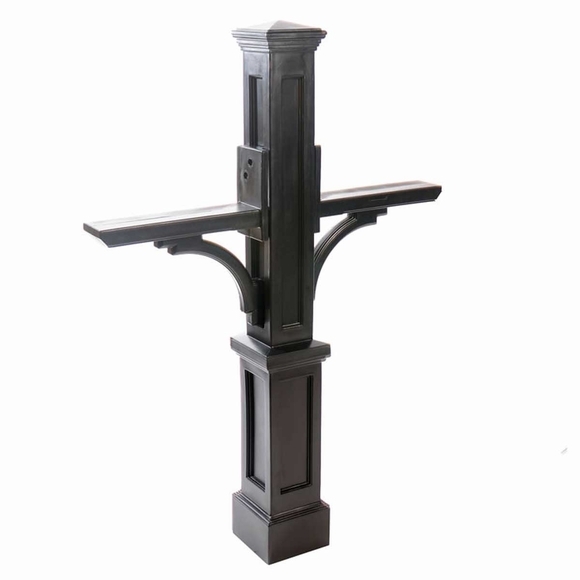 Design features include a flat top, decorative molding details, a mailbox support arms. Note: 4�4 wood post, mailbox, and mailbox mounting hardware NOT included. Made from high-quality 100 percent polyethylene with built-in UV inhibitors for long-lasting protection from the elements. Dimensions: 8"W x 39.625"D x 56.5"H.
Top inset panel on the post measures 1.9"W x 25.5"H.
15-year mg warranty for residential use. 5-year mfg. warranty for commercial use. USPS guidelines recommend that the bottom of the mailbox should be 41" to 45" off the ground and the front of the mailbox should be 6" to 8" from the curb. Double Poly Mailbox Post holds two lightweight curbside mailboxes weighing less than 7 pounds. Installs easily over a 4x4 post (not included). Made in USA.